We store our motorhome at Apple Storage. The facility is really clean and secure. Michael and his staff are fantastic. Excellent and friendly service. Clean, secure and convenient. Stored my boat for the summer and would definitely recommend this to others. Thanks for the great service. Clean, safe, nice knowledgeable staff. Thanks for your help! I recently rented a storage unit with Apple storage. Let me tell you how quick and easy it was! I went online on Saturday morning booked a unit, which I got a discount for booking online. Within the hour I drove to Apple Storage to unload my things and Mike had me ready to go! He was very kind, and personable. He went through all the paperwork and explained everything. He had someone actually take me over to the location of my unit as well. There was also another gentleman who was in the office and he made sure that we were both very well taken care of. I felt like my business was very important to them and they treated me so nicely that it actually made my day! Thanks for a great experience during a tough time! Nice folks! Quick response, new indoor units, good prices, and signup was easy. Mike was very kind and helpful, he made some great suggestions for my storage needs. I appreciate all his help. I just moved my RV in with Apple for the second summer. It is a safe and clean place, and Michael has always treated me with respect. I'm happy to give them a five star review. Thanks. Just went in to make a payment and look at my locker. The staff is beyond accommodating and so helpful. I am so happy to see that after a year this site is still immaculately maintained and my rate is so affordable! Thank you Apple Self-Storage. Before our first showing, our real estate agent was insistent, that we decluttered our house. 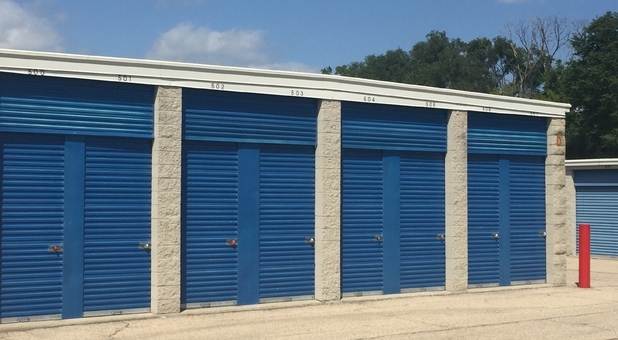 Living in Hawthorn Woods, we rented a storage unit with Apple Self-Storage. We chose a unit where we could easily drive our car up and unpack. We worked with the owner Mike, who was professional and customer focused. Our rent was very competitive, and the facility was of high quality. If you prefer supporting local businesses, and want a direct relationship with an owner, then I highly recommend working with Mike at Apple Self-Storage. Apple self-Storage offers save and secure RV parking. Ask for Mike. I think he is now the owner, but is their all the time. Great experience! The manager Mike was efficient and friendly! The self-storage facility was clean and spacious. Apple even helped us move things from our truck into our storage unit. Really clean storage facility, with good monthly rates. Very accommodating and helpful. Quick and convenient access, and the facility is very safe and clean. I would recommend them to anyone looking for storage in the Island Lake area. I rent a large unit from Apple Self-Storage, and stop by almost every day to grab my tools. I really like the extra height of their storage units (mine is 14'), it allows me to maximize the unit’s space. Apple is a very good storage option, and I recommend them highly. We are very satisfied with Apple Self-Storage. Clean facility with competitive rates. Mike is very professional, and helped me move my boxes of book into my new indoor storage unit. Fantastic facility. It's great to have such a conveniently located storage facility in the neighborhood. Very clean and great customer service. I'd recommend to anyone! Tim and Mike are awesome! Tim and Mike are awesome! They were wonderful when our mom passed and made the whole process so easy for us to transfer her belongings to storage, and equally as easy when we finished. The facility is safe, clean, well lit, and easy to access. Very highly recommended, I would definitely use them in the future if the need arises. Have rented a 2nd floor climate-control storage unit from Apple Self-Storage for some time; and because I like them so much I want to share why I continue to rent from them. First, they have a great location right on Rand Road which is on my way home from work. Secondly, the indoor facility is great and much nicer then what I have seen elsewhere. Third, the rent I pay continues to be less than a comparable unit down the street. Apple Self-Storage has always treated me well they are very professional, and are always very friendly. I will continue to recommend them to my friends and family when I am asked. Apple Self-Storage located in Wauconda provides terrific service and is very well maintained at all times. I highly recommend Apple Self-Storage to all people living near this location. I service my Coachmen RV at Camping World. When I was looking for a new place to park; Camping World recommended I stop by Apple Self-Storage on route 12 in Wauconda. Boy, so glad they did! Apple has been great. I’ve a reserved 42’ parking spot, great turning area in front of my spot, 24 hour access, and always plowed in the winter. I high recommend Apple Self-Storage. I like to keep my money locally when it’s possible. So, I really like that they are family own, and managed. These are good people who really care about customers. They offer a verity of storage options, and keep the place in really good shape. Love these guys and highly recommend them! The owner manages the property full-time, and is always around. I storage my boat, and also have an indoor storage unit with them. The rates are great and the facility very clean. I highly recommend Apple if you live in Lake Zurich, Wauconda, or North Barrington. I had just bought a 40’ RV and was having trouble parking it. Two of Apple’s staff offered to help me guide it into my reserved parking spot. They could not have been more helpful, or understanding. I’d highly recommend Apple for their self-storage units, or vehicle reserved parking. Best self-storage experience we’ve ever had! Apple Self-Storage has provided us with the best self-storage experience we’ve ever had. My works has required us to move many times; we’ve stored belongings across the country working with many self-storage companies. Our experience working with Tim at Apple Self-Storage was the most pleasant, and easiest we have ever had when storing our stuff. Thanks a ton Tim!